This will be a great chance to find out what mental health first aid is all about. 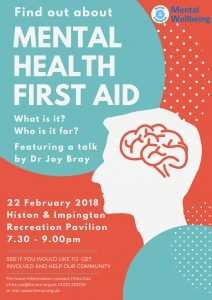 Dr Joy Bray has great experienced in delivering the Mental Health First Aid Course and will let us know what it involves and what the benefits are. We hope that we may be able to run a course for interested people in Histon and Impington.